Cardiff City Hall hosted the first Cardiff GLL Sport Foundation (GSF) Awards on Tuesday 27th June. The event took place to launch GSF across Cardiff, celebrate the successes of local athlete and recognise the partnerships with multiple stakeholders to the programme. 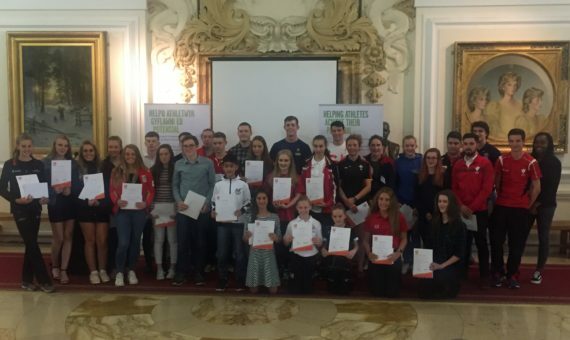 A huge 35 athletes attended the event with their guests to receive their certificates and cheques. Representatives from Cardiff City Council, Sport Wales, SportsAid Wales and Cardiff Metropolitan University attended the event; all working in partnership with GLL. The evening saw a Q&A with GSF ambassador Joseph Choong who spoke about his Rio 2016 journey as a Modern Pentathlete. Joe was able to share his story as an Olympian and inspire younger athletes to follow in his footsteps. On a more local level, there was a Q&A with Cardiff athletes: Elinor Snowsill, Wales ruby 7s captain and Hannah Robert-Straw, 15 year old junior GB sailor. Both provided very different, but insightful experiences about their athlete journeys. We feel very positive with the amount of athletes supported from Cardiff in year one, and have no doubt it will grow and grow! Thanks to everyone for attending the event and making it a massive success.